Bombay or now known as Mumbai was an unexpected trip as I never thought I would be visiting the city of Bollywood during my time in India. 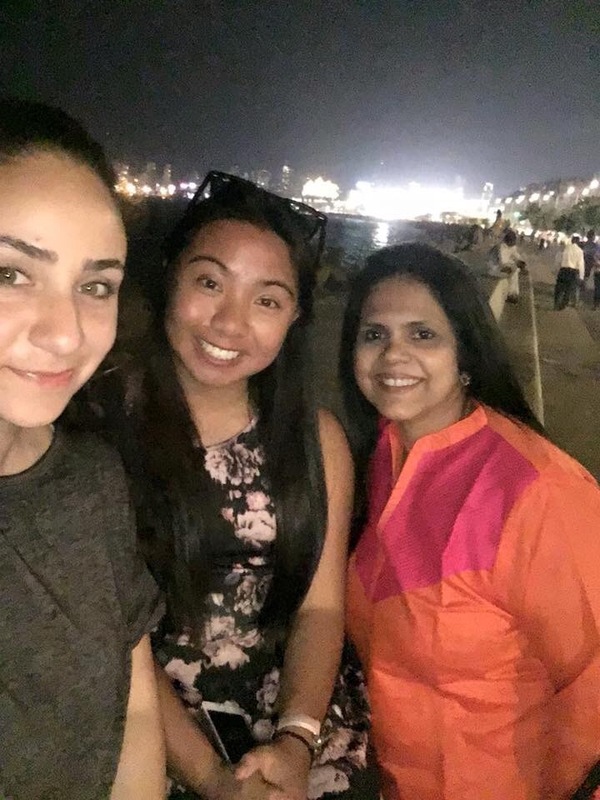 My city coordinator (Jenny) from Goa through ‘Leave UR Mark’ is originally from Mumbai and she kept on dropping down hints to visit her in the lively city of Mumbai. When we told her we were planning to visit her for the weekend she was ecstatic. With the permission from work to take the Saturday off (I work Tuesday- Saturday), my roommate and I excitedly booked our tickets and our accommodation to Mumbai. There are three ways of travelling to Mumbai, either by plane, train or bus. As we were limited on time we decided to fly. The cost of the round trip was around $103 AUD and the duration of the flight was 1 hour and 10 minutes, however, our flight got delayed by forty minutes. It is somewhat typical for flights within India to be delayed, for example, my flight from Bangalore to Goa was delayed for 1 hour and 30 minutes! Anyway, due to the confusion with the loudspeakers announcing the delay of our flight, Margot and I did not comprehend completely what they were saying. From the thick accent over the loudspeakers, we were blessed there was an Italian couple sitting opposite to us who did not understand the English announcement either. Thankfully they kept on asking a guy who was sitting next to them to translate each announcement into “English” again. From our eavesdropping ability, we understood the situation of our “delay” to Mumbai. The Elephanta Island is a UNESCO site where it is most famous for the cave temples. 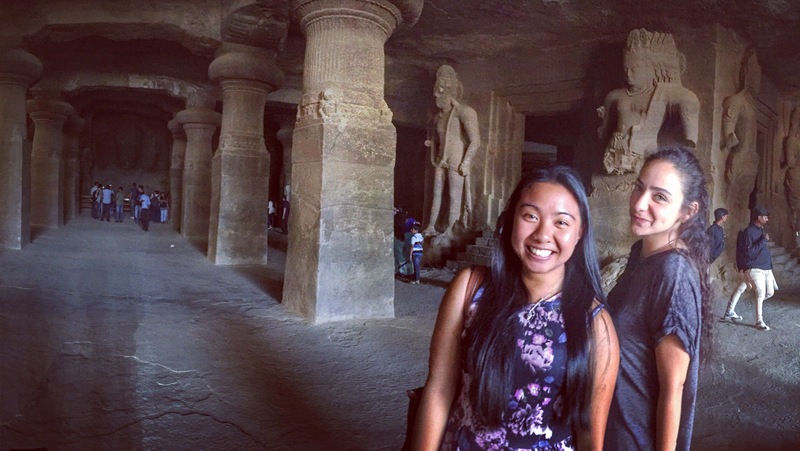 These cave temples are carved out of rocks and they are an art link to Shiva. Getting to Elephanta Island requires getting a boat, the boat departs behind the Gateway to India and takes approximately an hour. Tour guides will harass you regardless, you can do the island without a tour guide but if you want to learn about the rock carvings you can ‘bargain’ for a tour guide. Besides the caves, walking up towards the cave there is a line of little stalls where you can go shopping ranging from marble items to jewellery and clothing. Always remember to bargain at least 50-60% of the total price! Once you reach the end of the stalls and turn right, you can do a ‘hike’ and be able to see the view from the island. Also, you will definitely will see plenty of monkeys, most are friendly but heads up if you are carrying a water bottle they will attack you! My poor friend was attacked by one and I may admit I was using her as a shield! Tip– Try to get a boat coming back to Mumbai around 5pm so you can see the sunset with the Gateway of India and the Taj Mahal Palace in the background. The two amazing and grand architecture are situated at the southern point of South Mumbai. The iconic Gateway of India was built during the British rule in Mumbai and it was an Indo-Saracenic style, it was to honor the landing of King George V and Queen Mary when they visited India in 1911. Colaba Causeway is a busy but lively area where you get restaurants, cafés and of course shopping along the streets with the mix of boutique and market stalls. The Leopold cafe is worth checking out with its old school interior and having posters of established artist plastered around the background. During the Mumbai attacks, Leopold was also one of the first sites being targeted, the remains of the shots in the window are still visible. 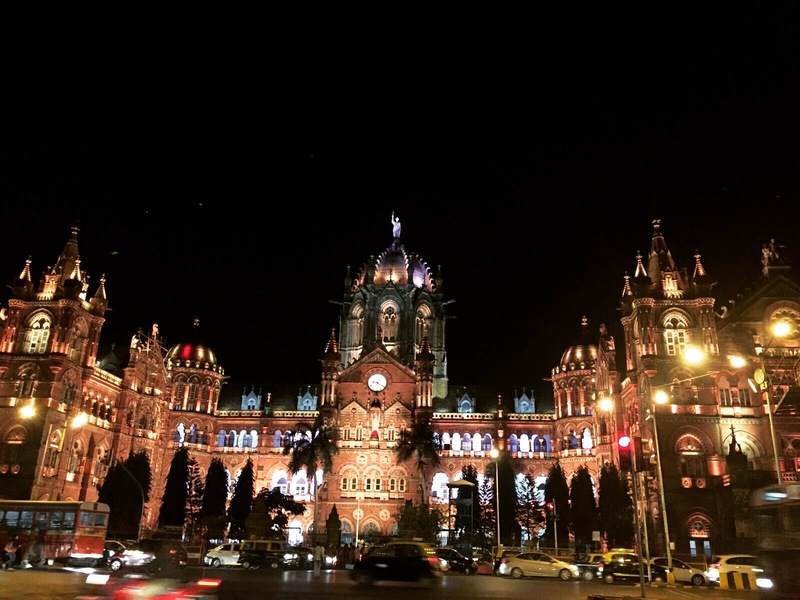 Also known as Victoria Terminus, the historical railway station is also a UNESCO World Heritage Site. With it’s Indo-Saracenic architectural it would be hard to overlooked. It is definitely worth visiting at night as the station lights up in pretty colours. For me personally visiting a slum was for educational reasons and to be able to understand the concept of a slum. My friend suggested doing the Dharavi Slum tour with “Reality Tours” so I jumped at the opportunity and booked an afternoon session. I honestly did not know what a ‘slum’ was technically is. My assumption was an area of mass people living together in poverty. However, a slum is a community where commercial aspects such as business, markets, hospital and banks are managed. People stay in government housing apartments work within the community. The Dharavi Slum is the biggest in Asia and it is a self-sufficient slum where people do not to go outside to work. More details of the Dharavi Slum will be posted on my blog! When in India you have to go saree shopping, it’s a must! It is such an enjoyable experience where you get to select all the pretty material designs and being draped in the chosen material. Sarees can range from 800 rupees ($16.50 AUD) and up. Even if you do not buy a saree it is worth the experience trying one on! The bridge is an unforgettable structure and an icon of Mumbai. Thankfully our hotel room has the perfect view. During the night it is worth driving or walking along Marine Drive. The lights are lit up along the coast and it is a pleasant atmosphere, even with the touchy couples in the background. If you decided to visit Mumbai during February, the Kala Ghoda festival it is usually held on the first Saturday and closes on the second Sunday. It is an art and cultural festive held in Kala Ghoda area of South Mumbai. The lively ambiance is filled with market stalls, food stalls and art sculptors throughout the street. There is a program for each day ranging from stand-up comedy, literature, theater and music. If you are lucky enough to stay in a nice place such as a hotel. Take advantage of sleeping in, having a bath, abusing the breakfast buffet or relaxing by the pool with a good book and swim. Transportation: Use uber as you would get ripped off with normal taxis. Also, auto rickshaws do not go to South Mumbai. Restaurant: Hakkasan, an Asian inspired restaurant. Will recommend the crispy duck salad. Went there during Chinese New Year and the ambiance was fabulous. There is also a famous nightclub in the building. NOTE: As we were staying in the Taj Land Ends we didn’t take the opportunity to explore other restaurants and café. Overall the Bollywood capital has a vibrate and lively atmosphere. With it’s British Raj influence and the mix of religions including Hindu, Muslims, Christians the city illustrates a diverse range of people. The hustles of the crowds and the diverse architecture capture the city life.